HKSE - Huadian Power 1071.HK is one of the uptrending stock in Hong kong exchange, using our ART system, the candlestick turn green when there is a bullish trend and turn orange when the trend change. Today we see that the chart turn from orange to green. Base on past occurrence, this mean a beginning of a new trend is possibly here. 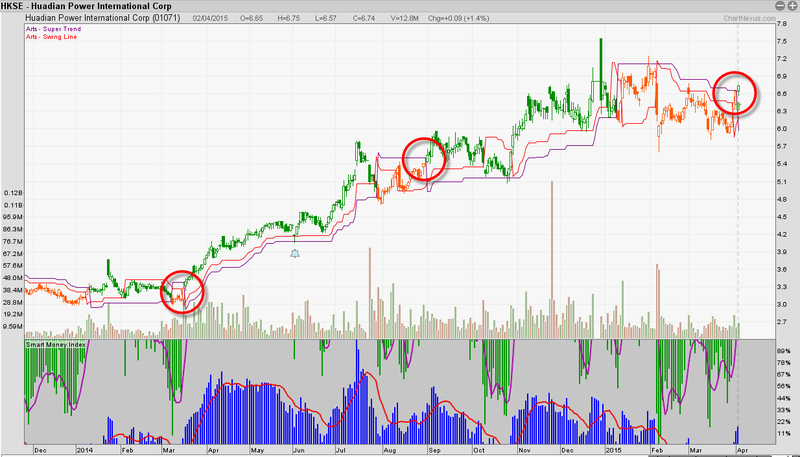 Stoploss can place at $6 if price turn around suddenly. Another similar company you can look at is Huaneng Power (902.HK), with PE at 9.89 Dividend Yield 5.19 and Market cap 36billion. Not familiar on HK stock? No worries, we have a weekly coaching session on Foreign shares. Just drop me a message, we will arrange a session for you!